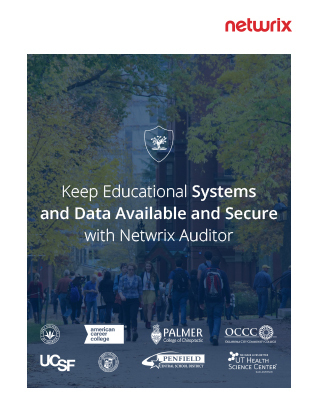 School districts, colleges, universities and other educational institutions have to safeguard students’ academic records, PII and other sensitive data against both internal threats and external attacks. They also have to ensure that users have continuous access to educational resources. How can you mitigate the risk of privilege misuse in a dynamic and highly populated environment? How can you honor your commitment to ensure the security of student data by quickly detecting malicious attacks? How can you cut the time and effort required to prepare for and pass regulatory audits? How can you make sure that educational processes are never interrupted by maintaining system and data availability? How can you improve the efficiency of your IT team?